Got it! Now sit back and relax. Our car lease suppliers will get in touch with you shortly. OneClickDrive.com works with 50+ car rental suppliers across Dubai, Abu Dhabi, Sharjah and, more recently, Ajman. Select among a range of cars: budget car rentals and even the most exotic, luxury cars and sports cars to rent and self-drive across the UAE. Book directly with our suppliers: No mark-ups, no booking fees – best rates guaranteed! Combining all our suppliers’ rental fleet, you can choose among 50,000 cars across all car types, brands, models available in the UAE. You can rent a small car such as a Kia Picanto 🚗 starting AED 50 / day and even the Lamborghini Urus 🚙 for AED 7000 / day. 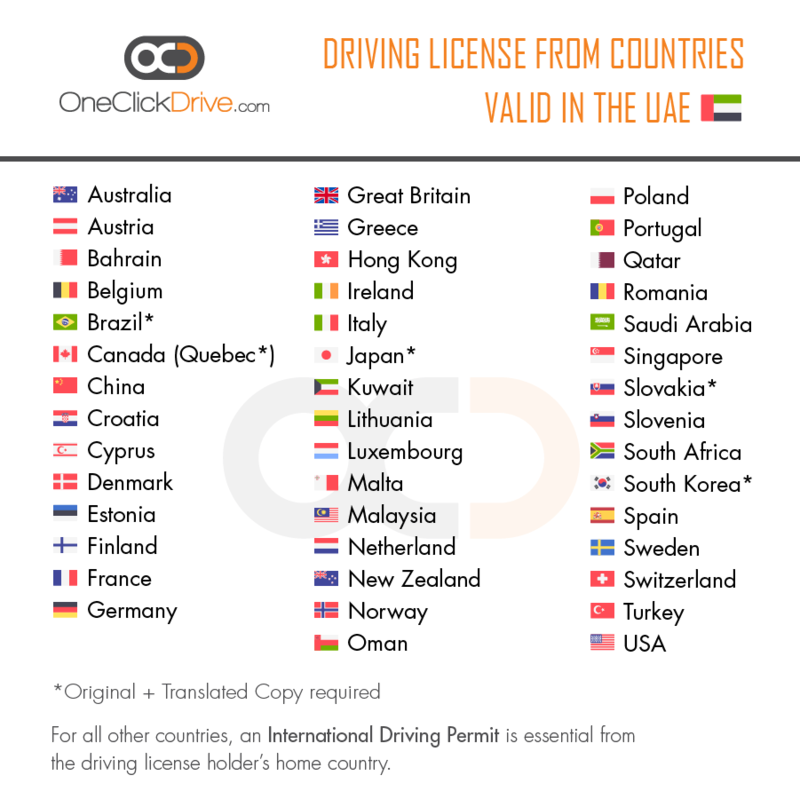 Visitors from the GCC, US, UK, Canada, Europe and certain other countries can drive with their home country driving license, without the need of an (IDP). Finding the best car rental and leasing solution for your personal or business use is now easier than ever. Access competitive rent a car offers and car lease plans through OneClickDrive’s network of car rental companies in Dubai, Abu Dhabi, Sharjah and Ajman. Apply for a long-term car rental offer through OneClickDrive.com and receive multiple quotes from the top car leasing companies. Or check out monthly offers from our local, RTA-approved car rental partners. Our car rental suppliers offer the latest range of car brands and models for self-drive with door-step delivery service 🏨. Tourists, visitors as well as UAE residents with valid driving license are eligible to rent a car in the UAE. Search, compare and rent with over 50 car rental companies. Through OneClickDrive.com, you can be sure to find the perfect rental car in Dubai. Whether you're looking for a short-term rental to visit the UAE 🇦🇪 or a monthly rental car in Dubai or Abu Dhabi. Compare offers and shortlist based on your budget and requirements. Contact the car rental supplier offering the car you want (at the price you want!) via phone, WhatsApp or email. All types of cars are available for hire in Dubai ranging from economy cars to luxury, sports and super cars. Our suppliers offer the most competitive rates all round the year. Hire at the best market rates on daily, weekly, monthly and even yearly basis. Based on your preference and budget, select your desired hatchback, sedan, crossover, luxury or sports car, SUV, van, bus, truck or any type of vehicle including vans with wheelchair lift / ramp. Free delivery for monthly deals and luxury cars priced above AED 1000 / day. Compare offers and book with the car rental provider directly! OneClickDrive.com hosts the largest selection of convertible cars, luxury cars, sports cars, exotic SUVs and supercars. Rent it for a day (24 hours minimum), a week or even on monthly-basis in Dubai, Sharjah or Abu Dhabi. All prices include insurance and standard mileage limit. Looking for the ultimate luxury experience? Book our chauffeur service online and travel in uber comfort across the emirates. Choose among a suite of cars, vans and SUVs - ideal for your family, corporate clients as well as HNI VIPs. Have our trained chauffeurs drive you or your guests straight from the airport with meet and greet service. Equipped with a GPS and local experience, our professional drivers 🕴️ will drive to your every destination or meeting on time at ease. Our rent a car with driver service is available on hourly and trip basis across the UAE, 24x7. For pickups from the airport, we track your flight schedules and add extra wait time when required. Ensure that your guests are picked up in style - anytime, all the time! Don't believe us? Simply contact us with details about the car you wish to rent for self-drive, lease for long-term or hire with a driver including your budget and details of your requirement. We promise to get back to you in a couple of hours with an offer you'd find difficult to reject. Besides our service is completely free of cost! All you need to do is book with and pay the car rental company you get the best offer from. Looking for more guidance? Read car rental tips from our blog to make the most of your rental experience. Find discount offers and upgrade your knowledge about the UAE's roads and driving laws.